Mix salt to the puttu flour and add warm water little by little. When we hold the flour it should hold the shape and when we leave it should become flour again. That is the right consistency. Add the flour in a vessel and place it inside the cooker. Add palm sugar in a small bowl. Add 3 tbsp water and cardamom powder. Make sure that the sugar is melted. Place this small bowl on the flour. Now cover the flour bowl with a lid. Cook on high for 8 whistles. Release pressure manually. Remove the syrup bowl and mix it with the cooked flour. Add ghee, roasted nuts and mix thoroughly. 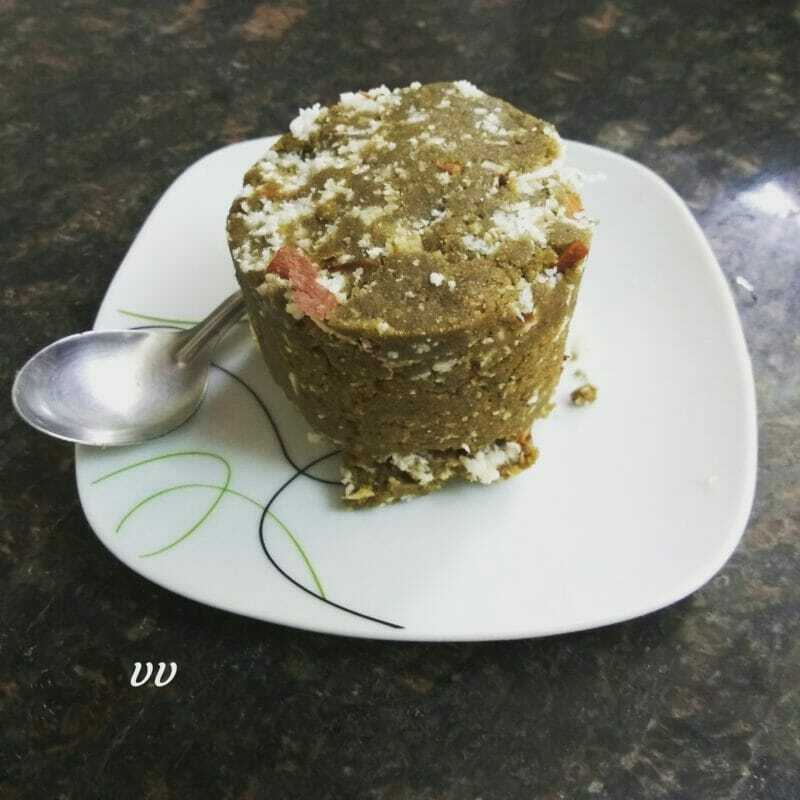 Within minutes soft grainy lump free puttu is ready. 1. Normal Kambu flour can also be used. Roast the flour on low heat till nice aroma and then proceed. 2. Palm jaggery/karupatti/palm candy sugar can also be used instead of palm sugar. Can this be prepared with puttu kozhai instead of cooker? Does kambu takes long time to cook and thats why we need 8 whistles? I have not tried with putting kozhai. But it is possible. Steam a little longer than rice flour. You’ll get an excellent puttu!